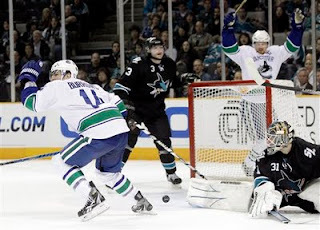 Well, it will be a fishy series when the Vancouver Canucks face the San Jose Sharks. Anyone who watches the Discovery Channel will know that Orcas eat Sharks, but will the Western Conference Final unfold in the same manner? As you likely know, the Canucks won the regular season series 3-0-1 against San Jose, but with two of the four games going to a shootout, it can hardly be described as complete ownership by Vancouver. In fact, in two of the match-ups, San Jose recorded 48 and 46 shots. See below for highlights of the four games. This series will likely be the toughest test for both teams thus far in the post-season, at least in terms of depth and talent across the ice. Based on the regular season, Vancouver boasts the best line in this series with the Sedin twins and Alex Burrows, but Thornton, Marleau and whoever they are matched with will be a formidable match up. Both lines have struggled at times (to be generous) this post season. After the top lines, Ryan Kesler for Vancouver and Ryan Clowe for the San Jose Sharks have been the heart and soul, the engine that powers their respective clubs. Clowe is a bit less dynamic but put up a bunch of points, while Kesler is the early favourite for the Conn Smythe Trophy based on his performance thus far. With injuries to Mikael Samuelsson and potentially Chris Higgins and Henrik Sedin, the Canucks may not have depth on their side up front for the first time in their post season. The Sharks can roll three good lines, with Dany Heatley, Joe Pavelski, Logan Couture, Ryan Clowe, Devin Setoguchi and others to compliment Thornton and Marleau. After the Sedin twins, the Canucks do have some depth of their own. Burrows, Kesler, Raymond, Higgins, Samuelsson, and even Hansen are either creating offense, or are tough to play against. Give a slide edge to the Sharks though in depth, but if the Sedin twins play to their capability, the Canucks may have more game-breakers. On defense, the edge probably goes to Vancouver. The Sharks have Dan Boyle and then a cast of steady but unspectacular blueliners. Douglas Murray, Nic Wallin, Ian White, Jason Demers and Marc-Edouard Vlasic. The Canucks meanwhile have Christian Ehrhoff and Alex Edler, who when at their best would be a better pairing then Dan Boyle and any of the others. The Canucks also have a solid shutdown pairing of Kevin Bieksa and Dan Hamhuis that has really emerged in the playoffs. Closing out the blueline, Sami Salo, Keith Ballard, Aaron Rome or Andrew Alberts will comprise the last pairing. Look for Alberts to draw in more often this series to combat the Sharks size down low and in front of the net. In goal, you have last year's Stanley Cup winning goaltender in Antti Niemi. Niemi was solid but unspectacular and cannot shake critics who claim he was an average goalie on an awesome Blackhawks' roster last year. He's looking to prove them wrong. Speaking of proving critics wrong, Roberto Luongo has been nearly lights out since being replaced by Cory Schneider in Game 6 of the Chicago series. Luongo's numbers are quietly near the top of all playoff netminders and he is definitely out to stake his claim to a Stanley Cup. Given the longevity of solid goaltending from Robert Luongo, and current playoff statistics, he probably gets the slight edge. This series will be an exciting series with a lot of close games. The teams appear to be very evenly matched and have had similar paths to get here. Both teams have massive expectations and have fallen short in the past. Up until this year, the Sharks have had the Canucks' number in the regular season. San Jose's size up front has given Vancouver troubles. This time around, the Canucks have an improved blueline and a more mature corps of forwards. The Sharks have also lost Evgeni Nabokov and some depth on the blueline. For the Sharks to win, they'll have to shut down the Sedin twins, and find a way to make Roberto Luongo's life as difficult as it was against Chicago for part of the series. For the Canucks to win, they'll have to have a better effort from the Sedin twins, and their lineup will have to play to its potential each night. They cannot afford nights off like Games 4-5 of Chicago series, and Game 2 and 5 of the Nashville series. If Vancouver shows up and plays as to potential, they should take it in 6.